OSHA research studies estimate that there are approximately 25,000 yearly injuries due to falls from ladders. For this reason alone, JCHAMMER, INC. and its’ team of inventors have developed and designed the “MULTI-USE LADDER SAFETY BRACE” to help prevent such accidents from happening. The MULTI-USE LADDER SAFETY BRACE has adjustable arms that fit the application to size. The rubber shoes automatically adjust to different angles. 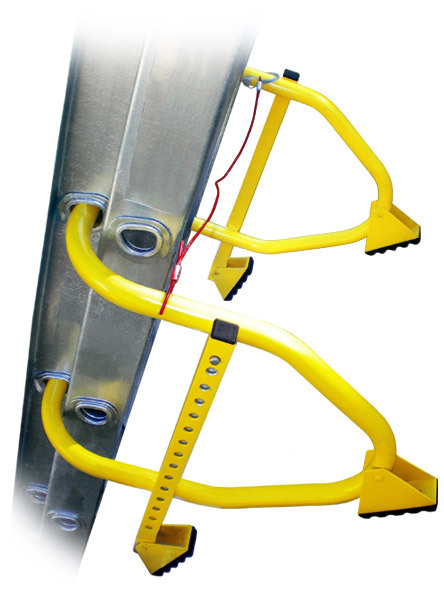 The MULTI-USE LADDER SAFETY BRACE is made of light weight aluminum tubes that fit standard extension ladders. It is easy and quick to install. Place on the extension part of the ladder without the use of any tools. The bungee cord maintains the brace together to prevent from falling out of place. Transport ladder by using MULTI-USE LADDER SAFETY BRACE safely and securely. Stabilize the four rubber shoes onto roof top to prevent damage to the cabin top, keeping the ladder away from the edge of the cabin. Secure the ladder by using 3 ratchet tie-downs. Secure ladder without the use of any tools. The arms rest onto the roof top and its’ rubber shoes automatically adjust to the roof top angle; preventing damage to the roof top and keeping the ladder in the place of rest. The arms fit into the gutter, and with little adjustment, the arms and rubber shoes will fit to the size of the gutter; keeping the ladder from damaging the gutter. Feel safe and confident the ladder will not fall back. When there is no gutter, secure the ladder by placing the MULTI-USE LADDER SAFETY BRACE at the bottom of the ladder. By adjusting the arms, this will give the ladder four rubber supports at the bottom of the ladder that will prevent the ladder from falling back or moving from its’ place of rest. Invert the MULTI-USE LADDER SAFETY BRACE and rest on roof top. It keeps the ladder away from the edge of the roof to install, repair, and/or clean gutter. Adjustable arms that fit the application to size. Made of light weight aluminum tubes that fit standard extension ladders.